Published on September 20, 2012 by cara.b.b. when i mentioned last week that we had another big project brewing, i wasn’t kidding – we’re moving! this has been the craziest, most whirlwind of a thing, and we weren’t even planning on it. bonkers, right? so, here’s the story. my dear sweet husband is what you might call a real estate stalker, and he looks online on a nearly daily basis. he’ll send me a few links weekly, but nothing was really enough for us to make a move. then one day he sent me a link to a house that stopped us in our tracks. we went to an open house that sunday, made a second visit wednesday, and our house was on the market the following week. we knew that our current house wasn’t our ‘forever home’ and that we probably wanted to get planted somewhere more long-term before beckett started school, so we really just sped up our timeline a bit. so, our house went on the market on a thursday morning, and we had a request for a showing within a few hours. over the next 3 days, our house was shown 6 times, and sunday morning, we had an amazing offer on the table. really, we thought this stuff only happened in the movies – certainly not to us – certainly not in this market. in the middle of this, we made an offer on the other house. the stars seemed to be aligning. the sunday that we got the offer on our house, we spent the entire day negotiating back and forth on both houses and probably spoke to our agent 20 different times. coincidentally, it was our wedding anniversary – we were sweaty and dirty from getting the house show-ready, tired and stressed out – cute! we came to terms on both houses by the next day and breathed a little sigh of relief. just recently, we got through the inspections and appraisals and breathed a much bigger sigh of relief. we haven’t signed anything yet, so the move isn’t set in stone, but if all goes according to plan, we’ll be moving in about three weeks. whew! are you still reading? so all this has me thinking about projects to tackle, new rooms to make our own, and how we can do it (well, some of it) before we welcome #2 in late january. the house is quite updated, but the finishings aren’t necessarily the things we would have chosen. right now, things are beige, beige, beige, and as you might know, that is so not us. we’re really excited to get our stuff inside and see how things are looking and then to start making a project punch list. i’ll be sure to keep you updated along the way, and thanks for your patience as my posts may continue to be sparse for a while. 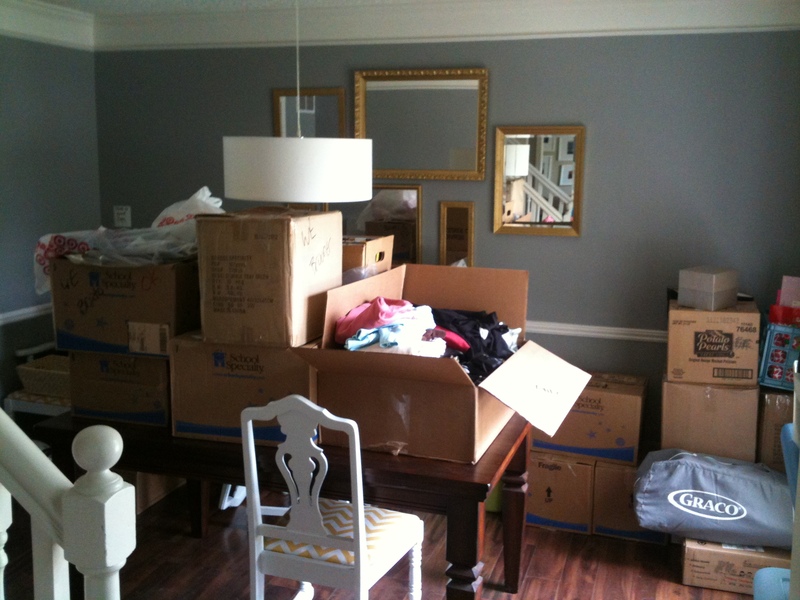 we are in various stages of packing at the moment, and my once pretty dining room now looks like a moving van threw up in it. where is the new house? we’re not going far, vicki! just west down 64th street into parkville. Parkville has such cute houses, I’m sure you found a gem! Happy packing! Woo-hoo, Cara! So excited that it worked out, and what a fun process decorating your new home will be. Can’t wait to see your selections and projects! Congratulations Cara! I love Parkville! !